Hello from Art Basel Hong Kong 2017! The show opens officially today, and we’re reporting onsite from Hong Kong. Li Jinghu lives and works in a city called Dongguan which is now famous for housing many of China’s factories. This work is an abstraction of Dongguan itself, and its component parts mean different things to the artist. Reassembled lights used by factories are strung up above the installation to approximate clouds in the sky — they represent a past connection with nature which is now lost to modern-day workers. The flux and change in the region is also represented by the discarded industrial moulds laid out below the fluorescent “sky.” These objects are actual factory moulds used for the mass production of toys. Art Basel preview visitors taking in the work, Archaeology of the Present (Dongguan). We particularly loved how the visitors could stroll right through the installation and that each component part had something clear to communicate to the audience. A close up of the lower structures : Yes, that’s Homer Simpson. If you think about it, it’s also a little cheeky isn’t it? Laying out a commentary on the ills of consumerism, at the world’s biggest art fair? This is a fabulous installation of 180 newly-reproduced bespoke handbags that are modelled around an Asprey handbag famously carried by Margaret Thatcher in 1985. Not a Shield, but a Weapon, (2016). The work is a statement on trade liberalization in the city of Marikina in the Phillippines, which was once a well-known site of leather manufacturing. The artist contends that Marikina has been in decline since it suffered from the easing of trade restrictions in the 1990s. The artist here is attempting to draw a connection between Margaret Thatcher’s neoliberalist policies – which encouraged free trade – and the demise of the town’s economy. What does an English Prime Minister’s policy have to do with the decline of a Fillipino town? Well, in a nutshell, some critics of neoliberalism believe that proponents of the philosophy (such as Thatcher) have forced many other countries to impose similar rules regardless of whether such policies are suitable. The flip side of free trade without regulation is a kind of “survival of the fittest” outcome, which can result in the alienation of millions of people who are unable to supply what the market demands in an effective way. From a utilitarian perspective this may not seem like too much of a problem, but it’s certainly no fun for the people who get left behind in the race towards efficiency. Fun fact: Thatcher’s original handbag was sold for 25,000 pounds at a charity auction overseen by the infamous Jeffrey Archer – which raises yet more questions about consumerism and the (sometimes ridiculous) way in which relative value is assigned to products. Again, this is a slightly impudent thought, given the placement of the work in a major site of consumerism where value is often subjective (i.e. the art fair)! What the original handbag looked like – Thatcher is pictured here with former US President Ronald Reagan at the White House, in 1985 (Credit: Daily Mail). Yet another fun fact: the term “Handbagging” was popularly used to describe Thatcher’s tough approach to politics, mimicking the action of being hit by a handbag when one disagreed with her views. We move on from counterfeit handbags to counterfeit… corpses? Ho Chi Minh : one part of the work Summit. (It’s rather ironic that this good Communist can be viewed lying right in front of a series of counterfeit handbags!). This creepy work imagines a meeting amongst the most significant Communist leaders in history: Mao Zedong, Kim Il Sung, Ho Chi Minh, Fidel Castro and Vladimir Lenin. To facilitate this “meeting,” the artist created lifelike effigies of the leaders. Castro lies faintly breathing but the rest of the leaders are sealed tight in their glass chambers. The summit of these great men is therefore an entirely silent one. (I can’t believe it’s not) Fidel Castro. The attention to detail in this work is quite amazing — so many folks were fascinated by the lifelike depictions that it was impossible to get an unobstructed shot of the effigies. Seeing as how not all of these embalmed figures are still available for viewing in their respective countries, the work presents a unique opportunity to not only think about the relevance of economic theories, but to also view copies of iconic historical artefects placed together in one site. If Madam Tussaud and the Cryptkeeper had a lovechild, this work would surely be it! The refugee crisis that’s racked the world has been filled with harrowing images, beamed right into our households courtesy of the mass media. As much as images like this one shock and sadden, borders have been just as quick to close to the masses of people fleeing from horrors in their home countries. These are stories close to Le’s heart, having himself escaped from Vietnam in 1978 by boat, together with his family. The Deep Blue Sea, (2017), Din Q. Le. At first blush, these massive scrolls appear to be no more than paper approximations of rolling waves, their bright colours rather cheerfully bisecting the gallery space. In reality, Le took 4 images from the refugee boat crisis in the Mediterranean and stretched each image across a 150 ft expanse. In so doing, the obvious narrative in the photograph is taken away and the picture is rendered into something totally abstract. Thus, the work replicates the very perspective held by bystanders to the refugee crisis: dispassionate observation which — no matter how empathetic — will always be one step removed from the realities faced by actual victims of the crisis. This large sculptural cherub, albeit one who seems to have lost his wings, lies in deep slumber, a park bench for his pillow. 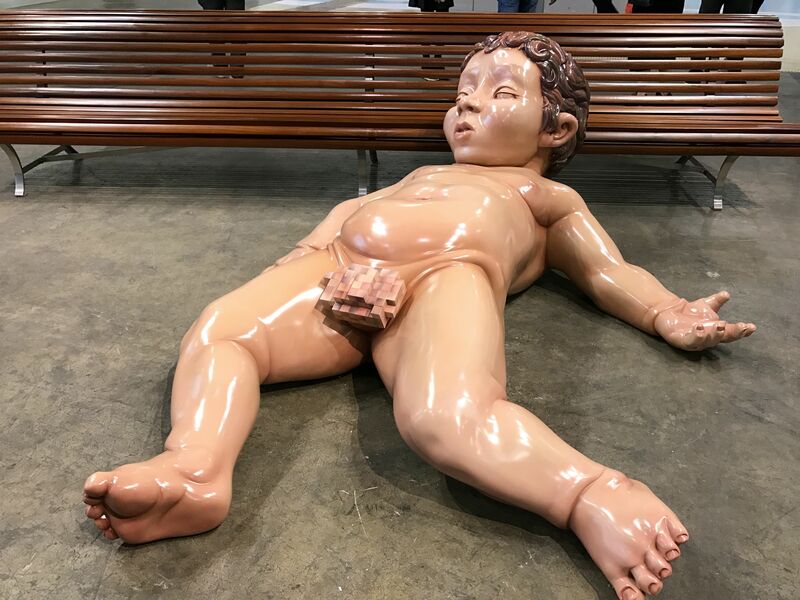 No one who “encountered”this fallen angel at Art Basel Hong Kong 2017 was able to walk away without stopping to take a photograph or to engage with the artwork in some way. As you can see, we were no exception! P and U hang out with the Putto. A sculpture by New Zealand contemporary artist Michael Parekowhai, Putto, from the Latin word putus, which means “little man”, depicts a figure commonly found in classical art and one that has also been co-opted by popular culture! See, for example, the picture of a cheeky putto smoking a cigarette on the cover art for the rock band Van Halen’s album, 1984. This sly and charming, yet audacious, work places the gargantuan putto, a heavenly creature more commonly found in classical art, in an earthly setting – an ordinary park bench of very human proportions. It prompts the viewer to question whether it is the sculpture that is out of place or if we are – did this little cherub fall from the heavens, stripped of his wings because of some transgression, or have we, the viewer, entered into a sacred realm where angels sleep? An excited viewer intent on seeing everything that Art Basel Hong Kong 2017 has to offer might actually walk by this work by Beijing-born artist Wang Wei, without realising it was there, so cleverly has the artist inserted the work into the space and incorporated the visual and spatial elements of the exhibition hall itself. Slipping Mural 2, 2017, Wang Wei – one can barely see the entire work at once! Wang Wei’s practice over the years has involved a series of experiments in which he investigates the nature of physical space as it is experienced in human terms. More often than not, it is the psychological experience he is interested in, rather than the purely physical. In this work, he uses mosaic tiles – popular, we were told, in his native China in his growing-up years and a sign of upward mobility – to create a large-scale image on the floor of the exhibition space, nonchalantly working around a support beam situated inconveniently in the middle of the work. A close-up of the work. Without sufficient distance and an appropriate vantage point, the viewer is unable to view the image in its entirety (above). The artist’s deliberate strategy of deconstructing the work and requiring the viewer to experience it only as fragmented parts of a whole (and underfoot!) enables us to look at the work through fresh eyes and investigate new layers of meaning. Moving from the lower level of the exhibition to the third floor, we are greeted, upon entering the exhibition hall, by Tibetan artist Gonkar Gyatso’s installation, Family Album. A large scroll hangs from the ceiling and drapes down, rolling along the floor like a catwalk, on which he poses a variety of life-sized cut-out figures. Family Album, 2016, Gonkar Gyatso. The work is rich in detail and visual imagery, incorporating icons from Buddhist religious scroll paintings as well as Western popular culture. Do zoom in for a closer look! The cut-out figures are photographs of the artist’s family members, dressed in a variety of roles and costumes, traditional and modern. The work is an attempt to reveal the complexity of identity, particularly from a Tibetan cultural perspective. Are we what we wear and does the outward “costume” that we don, define us? The artist places his characters on a stage or catwalk-like milieu, dressed as stock characters or kitschy cultural stereotypes, suggesting they are merely playing a role. Their expressions and postures invite us to look behind their outward appearance and suggest a more nuanced perspective on their identity, and ours. Last, but certainly not least, don’t miss Rirkrit Tiranvanjia’s immersive, intricate bamboo maze. The work is a multi-layered one, providing a series of experiences, both visual and sensorial, from the time the viewer first encounters the work from the outside and as he navigates its narrow corridors to eventually make his way through it. U stops for a shot – limited numbers of people are allowed into the installation at any one time, so be prepared to queue up. The artist has placed five different iterations of the same polymer bonsai tree, 3-D printed copies of the real thing, at different stages of its life, at specific sites in the maze. The trees are set on plinths inspired by Constantin Brancusi‘s sculptural wooden pedestals, creating a dialogue between base and sculpture and emphasizing the relationship between geometrically-sculpted matter and living form. Moving through the maze invokes a sense of peace and quiet reflection, a pocket oasis of calm in the midst of the art fair bustle and activity. The white polymer copies of painstakingly trained and crafted bonsai trees gently and gradually shedding their leaves provide an interesting contrast between technological artifice and the transient ephemerality of nature. The bonsai tree in full bloom…..
…but turn the corner, and it’s totally withered. Art Basel Hong Kong features a total of 17 Encounters and this is but a small selection – if you’re in town for the show, we would highly recommend checking out the remaining works as well. We’re also posting about the show on social media, so follow us there for more live updates! Written by: P and U.